I make chicken so often that my kids once told me we were all going to grow feathers and start clucking. But they never complained that it was the same old chicken, because it never was. There are few foods as versatile as this worthy bird, so it was always easy for me to prepare it in a multitude of ways. Over the years I learned that chicken dinner never has to be boring. Chicken meat is so mild–certainly not as distinctive as, say, lamb or duck–that you can pair it with all sorts of seasonings, condiments, fruits and vegetables, and it will be flavorful and delicious. Spice it up with curry powder or ras el hanout or lemon juice and dried oregano. Fresh herbs, tomato sauce, Ponzu, jarred duck sauce, teriyaki, black truffle oil–they’re all fine. Baste chicken with wine, orange juice or stock–couldn’t be better. One of the ways I try to make the “chicken-again?” dinner interesting is to cook the meat with fruit. I’ve used all kinds from apples to grapes to prunes and have found that pineapple and other acidic fruits are particularly well suited because they add a refreshing tang–especially welcome in the heat of summer. In addition, the fruit caramelizes gorgeously in the oven heat, creating a dish that’s mild plus piquant and sugary. You can stop there, but I add just a hint of heat for the back of the tongue (I used Sriracha but you can sprinkle the chicken with cayenne power instead), which makes the entire dish come together in beautiful and delicious harmony. Preheat the oven to 450 degrees. Place the pineapple in a roasting pan. Place the chicken pieces in the pan, partly on top of the fruit. Mix the olive oil, ginger, garlic, Sriracha and cinnamon in a small bowl and brush the chicken with the mixture. Season to taste with salt. Roast for 10 minutes. Lower the oven heat to 350 degrees. 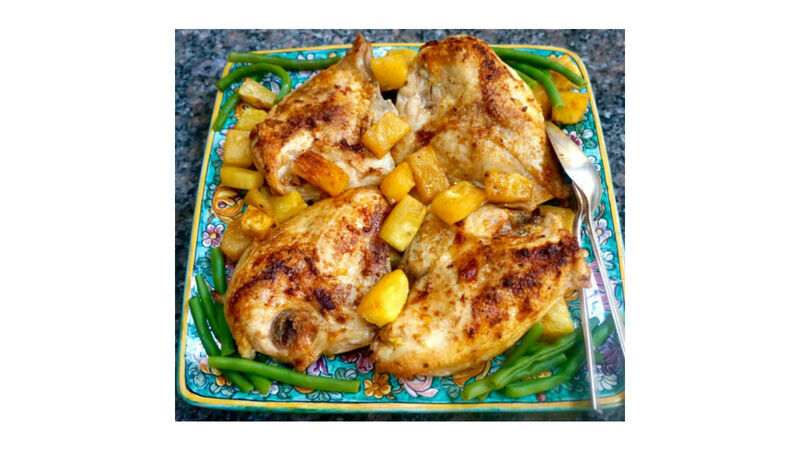 Pour the pineapple juice over the chicken and fruit. Roast for about 25-30 minutes or until cooked through (a meat thermometer inserted into the thickest part of the meat will register 160 degrees), basting once or twice with the pan juices. Let rest for 15 minutes before carving.